Wisdom of Life. 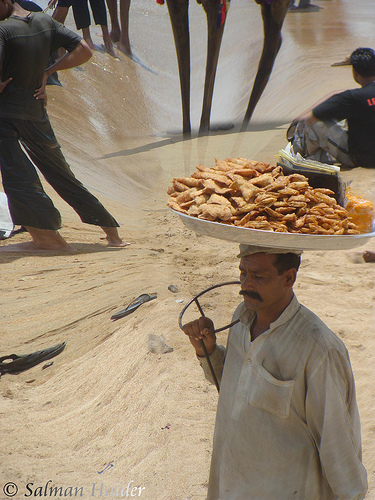 : The Samosa Vendor - Rags to Riches. Certainly an eye opener! Unbelievable!!! Today in India it's unbelievable .......the numbers are a little difficult to swallow, but interesting nevertheless. It was my regular train journey home from work.I boarded the 18:50 pm train from Paranur. When the train was about to leave Guduvanchery, a samosa vendor with an empty basket got on and took the seat next to me. As the compartment was sparsely occupied and my destination was still far away, I got into a conversation with him. Vendor: "What to do, sir? Only by selling samosas like this every day do we get a commission of 75 paise for each samosa that we sell." Me: "Oh, is that so? How many samosas do you sell on an average each day?" Vendor: "On peak days, we sell 3,000 to 3,500 samosas per person. On dull days, we can't even move 1,000 samosas a day. On an average, we sell about 2,000 samosas a day." I was speechless.....for a few seconds. The guy says he sells 2,000 samosas a day; at 75 paise each, he makes about 1,500 rupees daily, or 45,000 rupees a month. That's Rs 45,000 a month. OMG. I intensified my questioning and this time it was not for time passing. Vendor: "No Sir. Our proprietor gets the samosas through a samosa manufacturer and we just sell them. After selling we give him the money and he gives us 75 paise for each samosa that we sell." I was unable to speak a single word more but the vendor continued..."but one thing for sure...most of our earnings are spent on living expenses. Only with the remaining money are we able to take care of other business." Vendor: "It is a land business. In 2007 I bought 1.5 acres in Urupakkam for 3 lakh rupees and I sold it a few months back for 15 lakhs. Now I have bought land in Uthiramerur for 5 lakh rupees." Me: "What did you do with the remaining amount?" Vendor: "Of the remaining amount, I have set aside 6 lakhs for my daughter's wedding. I have deposited the other 4 lakhs in the bank." At this point, what could I reply. After all, I was talking to a millionaire! The train chugged into Chromepet station and the samosa vendor got up from his seat. What more is there to say..